This weeks Doctor Who was as surprising as it was brilliantly hard hitting. Not only did we have a companion tell the Doctor off for the first time; but also had an episode where the women held all the power. The uneasiness of last episode is gone and this season of Doctor Who is back to being simply fantastic! So let’s travel once more into the episode so that we can see just how impressive this episode really was. This episode began with a question – or rather the wrong answer to a question: ‘Am I special?’ After hearing that there was nothing special about her, Courtney Woods started acting like even more of a “Disruptive Influence”. From her outbursts to stealing some of the Doctor’s gadgets, she kind of proved his point of being nothing more than a problem child. Despite Clara’s insistence that you can’t just tell someone that, the Doctor stuck to his reasoning, which seemed to be proved even more so when Courtney decides to post photos on Tumblr while the moon was starting to crack apart. She seems like every other teenage girl. Though it wasn’t until the chips were down that Courtney made the hard call and showed just how special she was. Even though a mission leader – a seemingly responsible adult – and all of humanity itself chose to destroy the moon monster, it was a child that stood up for protecting this creature and not condemning it for being born. The Doctor’s initial words might have been harsh; but they were true. How can someone be ‘special’ in an ordinary situation? Whether in the show or our own lives, we’ve seen many talk a big game; but then turn tail and fall once actual problems arose. It is in hard situations that someone true worth is shown; and Courtney passed with flying colors. It’s no wonder the Doctor hinted at Courtney later becoming President. We’ve seen leaders kill for no reason before – like Harriet Jones in the Christmas Invasion – so it is immensely refreshing to see one that values lives even if they aren’t of Earth. We’ve heard about ‘fixed points’ and ‘time being in flux’ before; but never have we been given such a powerful depiction of it – at least not since the series reboot. The Doctor’s words here remind us that history isn’t just a text book with times that can be altered and times that can’t. Here we are reminded what makes a Time Lord a Time Lord, being exposed to the Time Vortex. The Doctor is able to see all of time if he chooses to look. Yet there are some moments that even the Doctor can’t see clearly. This was one of them. At first it seemed like this could be the moment humanity is driven to extinction by a hatching egg or carries on. If the moon had been nuked, the ‘dead baby monster’ would have remained there – drawing the moon chucks too it with gravity – leaving life on Earth unchanged; but if lived, it could destroy the Earth. In actuality of course the shell was thin and never posed a threat to humanity. So the actual flux was between humanity going unchanged (Choice A: Kill It) or seeing a gigantic creature fly off to explore the wonders of the universe rather than look down and destroy (Choice B: Let It Live). By seeing this event unfold, humanity followed suit and decided to set out and explore the beauty of the universe rather than look down and continue to squabble and destroy. In the end it wasn’t kill or be killed; but rather play it safe and be normal OR take a chance and be special – a situation not unlike the theme of the episode I explained above. As I started to mention last week – and as you may already know – Moffat’s Doctor Who has usually come under fire for being sexist. Clara has been a great companion so far so it seems as though that might be in the past; but this episode gave us something no episode has given before: a sustained period of no Doctor where a group of three women decide the fate of everything. Now the writer of this episode was actually Peter Harness rather than Steven Moffat. Either way, this is sure to be an episode critically analyzed for time to come. This season’s theme has been all about revealing who the Doctor is in comparison to antagonists, protagonists and who others “think” he is. This time around, we found his foil surprisingly in Clara herself, specifically in Clara’s role as teacher. 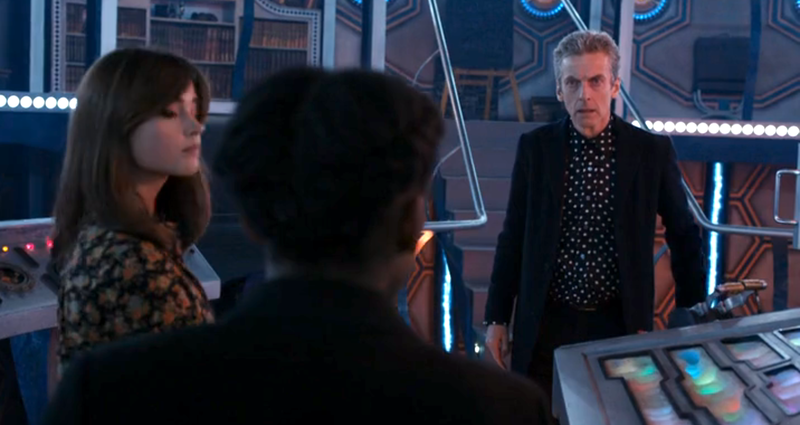 From the first episode this season “Deep Breath”, we could see that Clara took a very soft approach to teaching. The Doctor on the other hand – as we saw in this episode – doesn’t pull any punches nor candy coat anything. 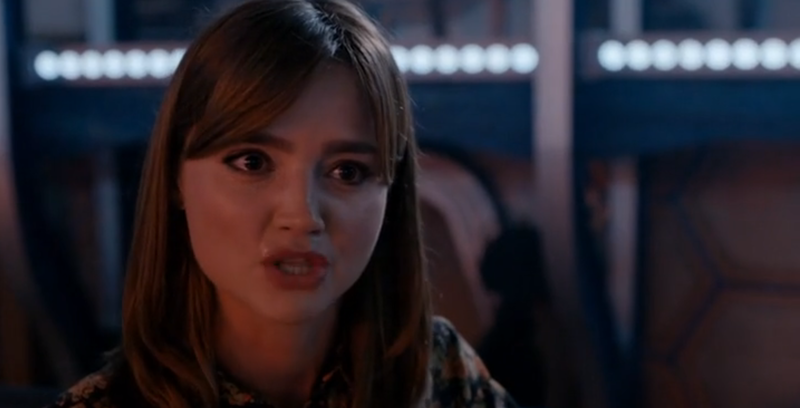 This juxtaposition can be seen at the start of this episode when Clara feel the Doctor should tell Courtney she is special – despite not showing anything of special worth. The Doctor of course ignores this and ends up learning that Courtney is special through her actions – actions in a situation she wouldn’t have been put into if the Doctor had just listened to Clara. On one hand we have a kind ‘training wheels’ approach to teaching and a trial by fire/‘remove the training wheels’ approach to teaching. Both have merit; but by episode’s end there is a clear winner based on merit; but it also causes the most backlash. Clara was obviously pissed that the Doctor just up and left her. He assures her that he did it out of respect; but Clara says he was just being patronizing and didn’t want to be bothered with lowly human affairs. Though if you pay close attention to the scene – and know the Doctor – you can see that he actually was doing it out of respect. Remember, the Doctor ISN’T of this world so it’s hard to judge him by our standards. As Capaldi said, he doesn’t fit in. He’s not one of us. 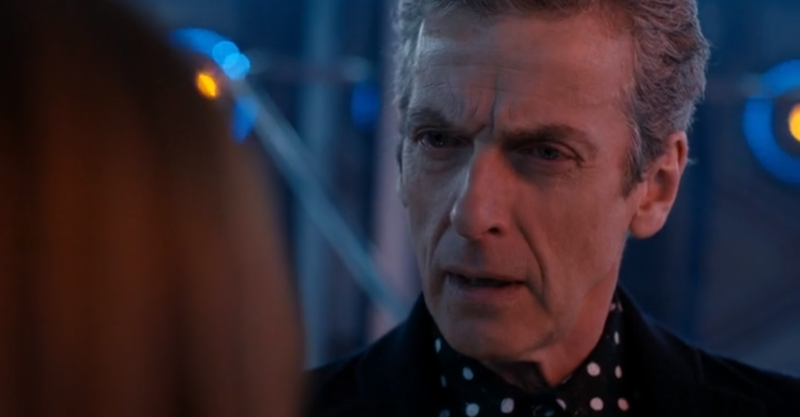 Though as we’ve seen before, he will ALWAYS come back for Clara. The Doctor was letting Clara and the girls decide the fate of humanity. As humans it was their right and he has no right to reign over them as some God. Yes, he knew Clara would choose right – to spare the creature – ;but even if she didn’t choose that option, he still would have returned. It might have looked like the Tardis returned when Clara made the ‘right choice’; but the Tarids can’t return on a choice. It needs a set time so the Doctor simply returned the very millisecond that the countdown was over so that whatever the choice was he could pick up Clara, Courtney and the astronaut. He wasn’t leaving them to die; but to just make their choice. The Doctor’s way did seem harsh; but it was out of respect. A bird who pushes its young out of the nest might seem cruel; but it’s the only way they’ll learn to fly. The Doctor’s methods might seem harsh; but the results are almost always worth it. Last episode, Danny warned Clara that a moment would arise that would push her too far. At first we figured it’d be an episode or so before this happened; but WOW that was fast. 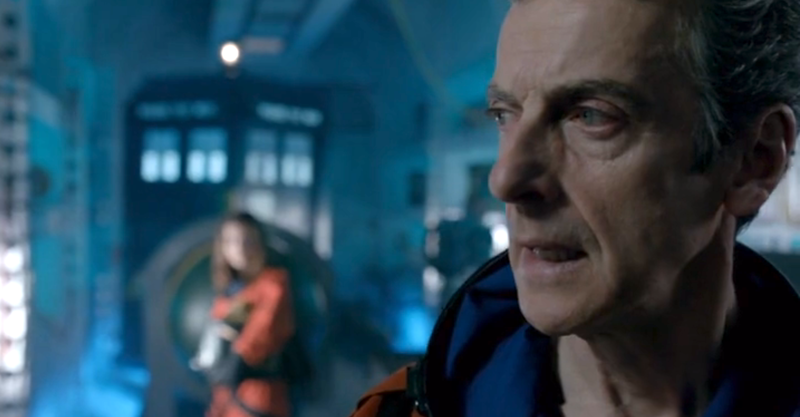 They seem to be wasting no time this season – or perhaps Clara will be leaving soon. 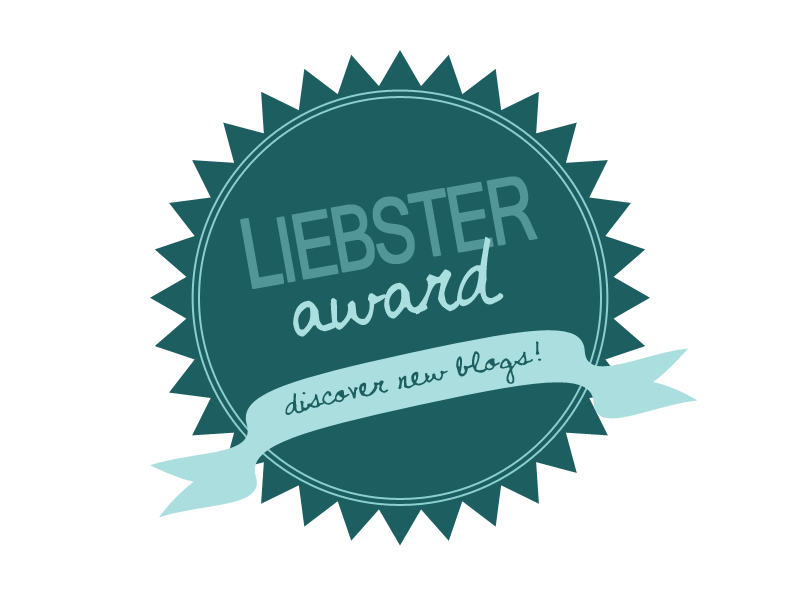 Either way, the moment that ‘broke’ her finally happened – or did it? Looking at this objectively, Clara has been in this situation before – even this season. During ‘Deep Breath’, the Doctor left Clara behind a closed door locked in with the Clockwork Cyborg and she handled it. Even more so, he returned for her. As we established already, Clara has done this all before and should know by now that the Doctor will always return for her. This was all the Doctor giving her respect. She’s been traveling through time with the Doctor for a while now and doesn’t fret when they both change history; but when she herself is in charge she doesn’t like it. Yes, this was a traumatic make or break moment; but remember that the Doctor was there right in waiting with whatever choice she made. Clara might have overreacted since – as we’ve already established – the Doctor really was giving her respect. Hell, this entire season Clara and the Doctor have been joking that she’s the boss – so responsibility should follow too right? He knew he babied her a little bit with Danny last time so he wants to give her the respect to decide her own fate on things; and Danny probably realizes this too. Mr Pink got wise all of a sudden and could tell that despite her words, Clara wouldn’t be done with the Doctor just yet. Think about it, how many times have you heard someone scream ‘I’m done with this person’ and then go back to talking with them/hanging out/dating them? Danny calmly listens to Clara’s trial and tells her that he’ll believe she’s done with the Doctor when she tells him calmly; and if she ever needs the support, he’ll share his story of leaving the army. In light of all this, I have to hand it to Danny for responding like a kind-hearted boyfriend. In a story about giant bacterial spiders and a monster ripping apart the moon, you’d think there’d be more ‘hard to swallow’ moments. Though to be honest that story isn’t that unheard of. The basic ‘problem’ of this episode was actually the premise of an Avengers Assemble episode – just change spiders/moon dragon to worm/hydra and throw in the Hulk. 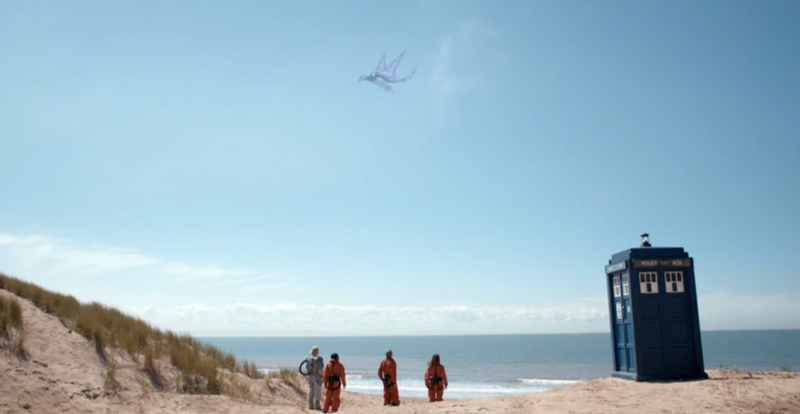 Additionally, it wasn’t even the size of the monster considering we have seen massive creatures before in Doctor Who – remember the Star Whale in “The Beast Below”? The one thing that seemed insanely outlandish – even for Doctor Who – was how immediately after birth, the ‘Star Dragon’ laid another egg. I’m not even going near the whole ‘reproduced seconds after being born’ aspect; but rather the fact that it just laid an egg the size of itself. HOW!??!?!?! To quote Austin Power 2, “the sheer mechanics of it are mind boggling!” So please, someone find me an instance of an animal laying an egg as big as it is – I’ll even settle for an egg a third of its size. Overall this was a great episode. There was even a Tom Baker reference with the YoYo – one of the Fourth Doctor’s little trinkets. Though more than the references this season, it is the new Doctor himself that is truly brilliant. Capaldi perfectly balances the Doctor who cares, but doesn’t hold your hand. He’s not of this world; but he has the potential to teach people to be more. Whether or not they can survive these trials by fire unscathed – physically or emotionally – is another story. I really don’t understand why everyone is so in love with this episode. Yeah, the acting was good in parts, and it was great to give the women the power. I’m all for strong female leads in fiction (I’m a proponent for a female Doctor down the line). However I felt that the episode had some put-offish undertones which put the actions of the characters in some troubling context, and the science was just so utterly awful, even for a show which flies fast and loose with the technobabble. I would feel the same way if I liked the story of the episode. While I liked elements of it, mostly the scenes between Clara and the Doctor at the end, and the scene between Clara and Danny, I didn’t enjoy the rest of the episode much at all and it just made the flaws more apparent. I’m usually the first person to say that everyone likes different thing, so the fact that I didn’t like this episode shouldn’t bother me, but it just seems like EVERYONE else liked it. It makes me feel left out in the cold. I even reviewed the episode on my site and gave it a 4, and it makes me worry that if anyone ever finds the review on my site and sees the low rating, they will think I am a troll and not take my site seriously. I almost want to change the rating there, but then I’m not being honest. I guess I just don’t like being so alienated from the rest of the fanbase like this. That’s a 4 out of 10 btw. haha I know the feeling John. That’s happened with some of my reviews too; but as along as you back up your feelings with relevant info then you’re not a troll 🙂 Hopefully the next episode is one you’ll enjoy. Thanks for commenting John, you ARE awesome. And I’ll be sure to check out your site as well! Regarding the creature laying an egg, remember that at this point the moon is about six times as massive as it used to be, so the creature only had to lay an egg about a sixth of its size, which seems much more plausible. And there are creatures on Earth that are born pregnant (aphids, for one) so it’s not unheard of. The only sticking point for me is that they never answered the question of where all that extra mass came from in the first place – the only answer I can think of is that the creature had some way of directly converting energy to matter, and added mass to itself from the sunlight. Seems a bit of a stretch, though, since it put on all this mass in just a few short years. I think Peter Harness just didn’t think that bit through. Yes, the ‘varying mass’ had me confused too. But the whole moon laying thing actually makes a bit more sense to me. Thanks Dan! I can easily let the moon-egg-mass thing slide, it’s the astronaut hearing the skittering of spiders out on the atmosphereless surface of the moon that irritated me.